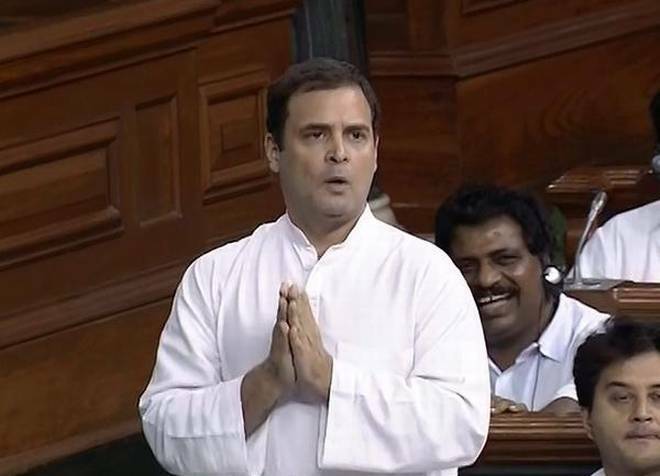 New Delhi: Congress president Rahul Gandhi took up his assault against the government on Rafale deal a notch higher in Lok Sabha on Wednesday. He produced an audio tape alleging that it contained a purported conversation in which Goa Chief Minister Manohar Parrikkar also former Defence Minister, is heard telling one of his Goa cabinet ministers that some important files pertaining to the deal are in his bedroom. Rahul reiterated his demand for a Joint Parliamentary Committee (JPC) probe into the controversial deal amid a ruckus in the House. A look at the previous JPCs would, however, put the Congress president to shame. For, all of them have come a cropper. As per Parliament records, seven Joint Parliamentary Committee (JPC)s have been set up so far to look into various issues, which have rattled the country and hijacked political discourses. None of them could identify the guilty, nail the culprits or yield the desired results to enhance people’s confidence in the Parliamentary system. The JPCs went into allegations ranging from the infamous Bofors deal of 1987 that dethroned the Rajiv Gandhi Government from power to the Harshad Mehta stock market scam in 1992. It also investigated into the soft drink pesticide issue and then the 2G spectrum row, usually referred to as the mother of all scams. The last time a JPC was constituted was to probe the VVIP chopper scam in 2013. The following year, the Manmohan Singh government was thrown out of power. Political observers said that JPC in itself is considered a jinx as no government, which has set up a JPC, has come back to Raisina Hill. In case of the first probe related to the Bofors deal, the JPC headed by B. Shankaranand, had 50 rounds of meetings. When the report was tabled on the floor of the House, it was rejected by the opposition on the grounds that the committee was packed with Congress members. The fate of the JPC report, which examined the Harshad Mehra scandal, remained uncertain. The government neither accepted the report nor went on record rejecting it. The committee headed by Ram Niwas Mirdha investigated irregularities in securities and banking transactions after the scandal broke out. The accused continued to remain at large. For the uninitiated, a JPC’s findings or recommendations are not bound to be accepted by the government, which has the right to withhold any evidence which, it thinks, could compromise national security. Critics have maintained that JPC is a forum to settle political scores and most of the meetings remain inconclusive. Walking out of a JPC meeting in a huff, one of the members investigating into the 2G spectrum row in 2012, told this correspondent that the “members were rather busy accusing each other inside and protecting their leaders rather than doing a careful analysis of the allegations”. Two or three sittings later, members began to lose interest, resulting in one of the meetings being called off apparently due to “lack of quorum”. The committee was headed by P.C. Chacko. Members belonging to BJP, JDU, CPI, CPM, Trinamool Congress, BJD, DMK and AIADMK accused Chacko of being partisan and expressed their “no-confidence” after the draft report gave a clean chit to then PM Manmohan Singh and the Finance Minister P. Chidambaram. In 2003, a Sharad Pawar headed JPC, which probed pesticides content in soft drinks, submitted its report, recommending stringent norms for drinking water. It also recommended the setting up of National Standards Body of India, which was agreed by Parliament and the government. However, no action has been taken on its recommendations even after 14 years.